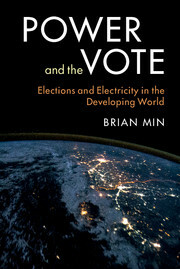 Power and the vote : elections and electricity in the developing world / Brian Min. Material type: Book; Format: print ; Literary form: Not fiction Publisher: New York, NY : Cambridge University Press, 2015Online access: Cover image Availability: No items available Checked out (1). Electrifying India : regional political economies of development / Sunila S. Kale. by Kale, Sunila S [author.]. Material type: Book; Format: print ; Literary form: Not fiction Publisher: Stanford, California : Stanford University Press, 2014Online access: Table of contents Availability: Items available for loan: Indian Institute for Human Settlements, Bangalore [Call number: 333.79320954091734 KAL 009113] (1). by India. Central Electricity Authority. Publisher: New Delhi : Government of India ; Ministry of Power, 2017Other title: All India electricity statistics : general review 2017.Availability: Items available for loan: Indian Institute for Human Settlements, Bangalore [Call number: 333.79320954 CEN 009542] (1). Publisher: New Delhi : Government of India ; Ministry of Power, 2016Other title: All India electricity statistics : general review 2016.Availability: Items available for loan: Indian Institute for Human Settlements, Bangalore [Call number: 333.79320954 CEN 009543] (1). Publisher: New Delhi : Government of India ; Ministry of Power, 2017Other title: Report on nineteenth electric power survey of India.Availability: Items available for loan: Indian Institute for Human Settlements, Bangalore [Call number: 333.79320954021 CEN 009544] (1). Material type: Book; Format: print ; Literary form: Not fiction New Delhi : [Central Electricity Authority, Govt. of India], 2016Other title: Electricity tariff and duty and average rates of electricity supply in India March 2016 | भारत में विद्यु टैरिक तथा शुल्क एवं विद्यु आपूर्ति की औसत दरें : मार्च 2016.Availability: Items available for loan: Indian Institute for Human Settlements, Bangalore [Call number: 333.79320954 ELE 009545] (1).